This photo by Paul Blinny shows a recent festive get-together by the Guild East Midlands and South Yorkshire group at Ranby village in Nottinghamshire. Some 19 sweeps enjoyed a meal, plenty of laughter, and a raffle, which raised £360. See all meeting details below. AHEAD of our AGM at the Trade Exhibition in March we are co-ordinating Regional Meetings around the country. Your input at these meetings will help us bring forward the most pressing and popular items to discuss at the AGM. Please see below for details of meetings currently confirmed. There are more meetings still to be confirmed and we’ll email you with details of additional dates and venues as we get them. Please contact the meeting host if you have questions. A big thanks to all our meeting hosts, they give their time freely to help us all. Working as a chimney sweep is challenging at the best of times, juggling self-employment with other aspects such as educating customers, your own training needs and balancing your budget. 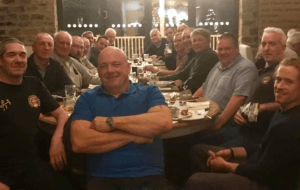 There’s no doubt we’re all passionate about our work but it can still feel a bit lonely at times – and that’s why the Guild of Master Chimney Sweeps was founded more than 25 years ago. Simply stated: we need each other. Our unique community provides a support base to reassure you that you’re not alone. The social hub for that comes not only from our annual trade show, and online networking – but the regional meetings. Regional meetings give a chance for Guild sweeps to share their knowledge and learn from each other; receive constructive criticism on what you’re doing right and what you’re doing wrong; discover new opportunities and referrals and, more than anything, enjoy banter with others in the trade who really do know ‘where you’re coming from’. So… 2019 presents exciting times at our regional meetings. Please do attend the nearest get-together in your region. CONFIRMED MEETINGS to date – we will email you with further dates as they are confirmed. Date & Time: 8th Feb @ 1900hrs.